Clarity Media is an experienced creator and supplier of kakuro puzzles. All kakuro puzzles are created in house and have one solution which can be reached through the use of logic alone. We can supply a large range of kakuro grid sizes and shapes, together with a range of difficulty levels to tailor the kakuro puzzles you buy to your target audience. We can provide puzzles in your choice of format, whether that be as Acrobat PDF format, EPS, or other chosen format. 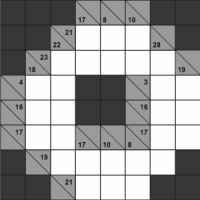 Kakuro puzzles are also known as cross sum, as opposed to a cross word. This is because the grid is a little like that of a crossword, but with number clues instead of word clues. The total at the start of each run of cells in a row or column is the sum total of those cells. You may not repeat a number within a run. Therefore if you need to make '6' off three cells then it cannot be 2,2,2 as that has repetition, leaving a combination of 1,2,3 as the only possible solution. The key to solving kakuro successfully is to look for combinations that have the least possible options, and then use this to narrow down the options for a cell, then cross reference between the various clues in order to reduce the options further until you know exactly what must be placed in a cell. Kakuro puzzles have just one solution and you can reach it without guesswork: just simple logical rules are required to solve kakuro puzzles. For an example of a puzzle in PDF format, please view the kakuro PDF - we can use any colours you wish when supplying puzzles. We can supply an order of any size of kakuro puzzles with quick turnaround times and meet any bespoke requirements. Publishers - Please contact us to buy Kakuro puzzles for publication in your book, magazine, newspaper, any other printed media or online. with a picture of each and a link to more information.